I am so thankful for all that God has blessed me with. When I think about how the majority of the world lives, I am in awe that He has given me such riches. Sometimes I get caught up in what others have and what my family doesn't. But more than not I am simply thankful that we are all healthy, have food to eat, a roof over our heads and clean water to drink. Sure, I'd love my bills paid off, a new pair of shoes, my home repairs completed and a family vacation but compared to the rest of the world, I am so blessed. This perspective has helped me so much over the past couple of years since we were burdened with outrageous medical bills from my daughter's surgeries and hospital stay. God has always provided for us and I praise Him daily. I am thankful for all of YOU. You have inspired me beyond belief. This bloggy world has made me a better teacher and rejuvenates my love of teaching DAILY. Thanks for all you've shared on your blog!! I've learned so much from you and other bloggers. I am so thankful for the teachers that take the time to share their awesome ideas. A really beautiful sentiment. 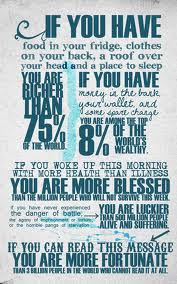 It really does all depend on your perspective-there are always people out there with less.